Monoamine oxidases (MAO) (EC 1.4.3.4) are a family of enzymes that catalyze the oxidation of monoamines, employing oxygen to clip off their amine group. They are found bound to the outer membrane of mitochondria in most cell types of the body. The first such enzyme was discovered in 1928 by Mary Bernheim in the liver and was named tyramine oxidase. The MAOs belong to the protein family of flavin-containing amine oxidoreductases. Ribbon diagram of a monomer of human MAO-A, with FAD and clorgiline bound, oriented as if attached to the outer membrane of a mitochondrion. From PDB: 2BXS​. Ribbon diagram of human MAO-B. From PDB: 1GOS​. MAOs are important in the breakdown of monoamines ingested in food, and also serve to inactivate monoamine neurotransmitters. Because of the latter, they are involved in a number of psychiatric and neurological diseases, some of which can be treated with monoamine oxidase inhibitors (MAOIs) which block the action of MAOs. MAO-A is also found in the liver, pulmonary vascular endothelium, gastrointestinal tract, and placenta. MAO-A appears at roughly 80% of adulthood levels at birth, increasing very slightly after the first 4 years of life, while MAO-B is almost non-detectable in the infant brain. Regional distribution of the monoamine oxidases is characterized by extremely high levels of both MAOs in the hypothalamus and hippocampal uncus, as well as a large amount of MAO-B with very little MAO-A in the striatum and globus pallidus. The cortex has relatively high levels of only MAO-A, with the exception of areas of the cingulate cortex, which contains a balance of both. Autopsied brains demonstrated the predicted increased concentration of MAO-A in regions dense in serotonergic neurotransmission, however MAO-B only correlated with norepinephrine. Norepinephrine degradation. 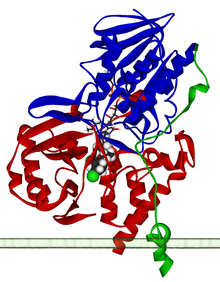 Monoamine oxidase is shown left in the blue box. Monoamine oxidases catalyze the oxidative deamination of monoamines. Oxygen is used to remove an amine group (plus the adjacent hydrogen atom) from a molecule, resulting in the corresponding ketone (or aldehyde) and ammonia. Monoamine oxidases contain the covalently bound cofactor FAD and are, thus, classified as flavoproteins. Monoamine oxidase A and B share roughly 70% of their structure and both have substrate binding sites that are predominantly hydrophobic. Two tyrosine residues (398, 435, 407 and 444) in the binding pocket that are commonly involved in inhibitor activity have been hypothesized to be relevant to orienting substrates, and mutations of these residues are relevant to mental health. Four main models have been proposed for the mechanism of electron transfer (single electron transfer, hydrogen atom transfer, nucleophilic model, and hydride transfer) although there is insufficient evidence to support any of them. They are well known enzymes in pharmacology, since they are the target for the action of a number of monoamine oxidase inhibitor drugs. MAO-A is particularly important in the catabolism of monoamines ingested in food. Both MAOs are also vital to the inactivation of monoamine neurotransmitters, for which they display different specificities. Because of the vital role that MAOs play in the inactivation of neurotransmitters, MAO dysfunction (too much or too little MAO activity) is thought to be responsible for a number of psychiatric and neurological disorders. For example, unusually high or low levels of MAOs in the body have been associated with schizophrenia, depression, attention deficit disorder, substance abuse, migraines, and irregular sexual maturation. Monoamine oxidase inhibitors are one of the major classes of drug prescribed for the treatment of depression, although they are often last-line treatment due to risk of the drug's interaction with diet or other drugs. Excessive levels of catecholamines (epinephrine, norepinephrine, and dopamine) may lead to a hypertensive crisis, and excessive levels of serotonin may lead to serotonin syndrome. In fact, MAO-A inhibitors act as antidepressant and antianxiety agents, whereas MAO-B inhibitors are used alone or in combination to treat Alzheimer's disease and Parkinson's disease. Some research suggests that certain phenotypes of depression, such as those with anxiety, and "atypical" symptoms involving psychomotor retardation, weight gain and interpersonal sensitivity. However the findings related to this have not been consistent. MAOIs may be effective in treatment resistant depression, especially those that do not respond to tricyclic antidepressants. PET research shows that use of tobacco cigarettes heavily depletes MAO-B, mimicking the action of an MAO-B inhibitor. Smokers who smoke for emotional relief may therefore be unintentionally treating depression and/or anxiety that is better addressed by an MAO-B inhibitor. There are significant differences in MAO activity in different species. Dopamine is primarily deaminated by MAO-A in rats, but by MAO-B in vervet monkeys and humans. Mice unable to produce either MAO-A or MAO-B display autistic-like traits. These knockout mice display an increased response to stress. A study based on the Dunedin cohort concluded that maltreated children with a low-activity polymorphism in the promoter region of the MAO-A gene were more likely to develop antisocial conduct disorders than maltreated children with the high-activity variant. Out of the 442 total males in the study (maltreated or not), 37% had the low activity variant. Of the 13 maltreated males with low MAO-A activity, 11 had been assessed as exhibiting adolescent conduct disorder and 4 were convicted for violent offenses. The suggested mechanism for this effect is the decreased ability of those with low MAO-A activity to quickly degrade norepinephrine, the synaptic neurotransmitter involved in sympathetic arousal and rage. This is argued to provide direct support for the idea that genetic susceptibility to disease is not determined at birth, but varies with exposure to environmental influences. However, most individuals with conduct disorder or convictions did not have low activity of MAO-A; maltreatment was found to have caused stronger predisposition for antisocial behavior than differences in MAO-A activity. The claim that an interaction between low MAO-A activity and maltreatment would cause anti-social behavior has been criticized since the predisposition towards anti-social behavior could equally well have been caused by other genes inherited from abusive parents. A possible link between predisposition to novelty seeking and a genotype of the MAO-A gene has been found. A particular variant (or genotype), dubbed "warrior gene" in the popular press, was over-represented in Māori. This supported earlier studies finding different proportions of variants in different ethnic groups. This is the case for many genetic variants, with 33% White/Non-Hispanic, 61% Asian/Pacific Islanders having the low-activity MAO-A promoter variant. Unlike many other enzymes, MAO-B activity is increased during aging in the brain of humans and other mammals. Increased MAO-B activity was also found in the pineal gland of aging rats. This may contribute to lowered levels of monoamines in aged brain and pineal gland. ^ Tipton KF, Boyce S, O'Sullivan J, Davey GP, Healy J (August 2004). "Monoamine oxidases: certainties and uncertainties". Current Medicinal Chemistry. 11 (15): 1965–82. doi:10.2174/0929867043364810. PMID 15279561. ^ Edmondson DE, Mattevi A, Binda C, Li M, Hubálek F (August 2004). "Structure and mechanism of monoamine oxidase". Current Medicinal Chemistry. 11 (15): 1983–93. doi:10.2174/0929867043364784. PMID 15279562. ^ Hare ML (1928). "Tyramine oxidase: A new enzyme system in liver". The Biochemical Journal. 22 (4): 968–79. doi:10.1042/bj0220968. PMC 1252213. PMID 16744124. ^ Slotkin TA (1999). "Mary Bernheim and the discovery of monoamine oxidase". Brain Research Bulletin. 50 (5–6): 373. doi:10.1016/S0361-9230(99)00110-0. PMID 10643441. ^ Shih JC, Chen K (August 2004). "Regulation of MAO-A and MAO-B gene expression". Current Medicinal Chemistry. 11 (15): 1995–2005. doi:10.2174/0929867043364757. PMID 15279563. ^ Tong J, Meyer JH, Furukawa Y, Boileau I, Chang LJ, Wilson AA, Houle S, Kish SJ (June 2013). "Distribution of monoamine oxidase proteins in human brain: implications for brain imaging studies". Journal of Cerebral Blood Flow and Metabolism. 33 (6): 863–71. doi:10.1038/jcbfm.2013.19. PMC 3677103. PMID 23403377. ^ Figure 11-4 in: Flower R, Rang HP, Dale MM, Ritter JM (2007). Rang & Dale's pharmacology. Edinburgh: Churchill Livingstone. ISBN 978-0-443-06911-6. ^ Gaweska H, Fitzpatrick PF (October 2011). "Structures and Mechanism of the Monoamine Oxidase Family". Biomolecular Concepts. 2 (5): 365–377. doi:10.1515/BMC.2011.030. PMC 3197729. PMID 22022344. ^ Kalgutkar AS, Dalvie DK, Castagnoli N, Taylor TJ (September 2001). "Interactions of nitrogen-containing xenobiotics with monoamine oxidase (MAO) isozymes A and B: SAR studies on MAO substrates and inhibitors". Chemical Research in Toxicology. 14 (9): 1139–62. doi:10.1021/tx010073b. PMID 11559028. ^ Domino EF, Khanna SS (March 1976). "Decreased blood platelet MAO activity in unmedicated chronic schizophrenic patients". The American Journal of Psychiatry. 133 (3): 323–6. doi:10.1176/ajp.133.3.323. PMID 943955. ^ Schildkraut JJ, Herzog JM, Orsulak PJ, Edelman SE, Shein HM, Frazier SH (April 1976). "Reduced platelet monoamine oxidase activity in a subgroup of schizophrenic patients". The American Journal of Psychiatry. 133 (4): 438–40. doi:10.1176/ajp.133.4.438. PMID 1267046. ^ Domschke K, Sheehan K, Lowe N, Kirley A, Mullins C, O'sullivan R, Freitag C, Becker T, Conroy J, Fitzgerald M, Gill M, Hawi Z (April 2005). "Association analysis of the monoamine oxidase A and B genes with attention deficit hyperactivity disorder (ADHD) in an Irish sample: preferential transmission of the MAO-A 941G allele to affected children". American Journal of Medical Genetics. Part B, Neuropsychiatric Genetics. 134B (1): 110–4. doi:10.1002/ajmg.b.30158. PMID 15717295. ^ Oreland L (January 2004). "Platelet monoamine oxidase, personality and alcoholism: the rise, fall and resurrection". Neurotoxicology. 25 (1–2): 79–89. doi:10.1016/S0161-813X(03)00115-3. PMID 14697883. ^ Bussone G, Boiardi A, Cerrati A, Girotti F, Merati B, Rivolta G (1 October 2016). "Monoamine oxidase activities in patients with migraine or with cluster headache during the acute phases and after treatment with L-5-hydroxytryptophan". Rivista di Patologia Nervosa e Mentale. 100 (5): 269–74. PMID 318025. ^ Filic V, Vladic A, Stefulj J, Cicin-Sain L, Balija M, Sucic Z, Jernej B (February 2005). "Monoamine oxidases A and B gene polymorphisms in migraine patients". Journal of the Neurological Sciences. 228 (2): 149–53. doi:10.1016/j.jns.2004.11.045. PMID 15694196. ^ Riederer P, Lachenmayer L, Laux G (August 2004). "Clinical applications of MAO-inhibitors". Current Medicinal Chemistry. 11 (15): 2033–43. doi:10.2174/0929867043364775. PMID 15279566. ^ Fiedorowicz JG, Swartz KL (July 2004). "The role of monoamine oxidase inhibitors in current psychiatric practice". Journal of Psychiatric Practice. 10 (4): 239–48. doi:10.1097/00131746-200407000-00005. PMC 2075358. PMID 15552546. ^ Fowler JS, Volkow ND, Wang GJ, Pappas N, Logan J, MacGregor R, Alexoff D, Wolf AP, Warner D, Cilento R, Zezulkova I (1998). "Neuropharmacological actions of cigarette smoke: brain monoamine oxidase B (MAO B) inhibition". Journal of Addictive Diseases. 17 (1): 23–34. doi:10.1300/J069v17n01_03. PMID 9549600. ^ Garrick NA, Murphy DL (1980). "Species differences in the deamination of dopamine and other substrates for monoamine oxidase in brain". Psychopharmacology. 72 (1): 27–33. doi:10.1007/bf00433804. PMID 6781004. ^ Bortolato M, Godar SC, Alzghoul L, Zhang J, Darling RD, Simpson KL, Bini V, Chen K, Wellman CL, Lin RC, Shih JC (May 2013). "Monoamine oxidase A and A/B knockout mice display autistic-like features". The International Journal of Neuropsychopharmacology. 16 (4): 869–88. doi:10.1017/S1461145712000715. PMC 3517692. PMID 22850464. ^ Shih JC (January 2004). "Cloning, after cloning, knock-out mice, and physiological functions of MAO A and B". Neurotoxicology. 25 (1–2): 21–30. doi:10.1016/s0161-813x(03)00112-8. PMID 14697877. ^ Caspi A, McClay J, Moffitt TE, Mill J, Martin J, Craig IW, Taylor A, Poulton R (August 2002). "Role of genotype in the cycle of violence in maltreated children". Science. 297 (5582): 851–4. doi:10.1126/science.1072290. PMID 12161658. ^ Sesardic N (2005). Making sense of heritability. Cambridge, UK: Cambridge University Press. ISBN 978-0-521-82818-5. ^ Shiraishi H, Suzuki A, Fukasawa T, Aoshima T, Ujiie Y, Ishii G, Otani K (April 2006). "Monoamine oxidase A gene promoter polymorphism affects novelty seeking and reward dependence in healthy study participants". Psychiatric Genetics. 16 (2): 55–8. doi:10.1097/01.ypg.0000199447.62044.ef. PMID 16538181. Lay summary – medialifemagazine.com. ^ Sabol SZ, Hu S, Hamer D (September 1998). "A functional polymorphism in the monoamine oxidase A gene promoter". Human Genetics. 103 (3): 273–9. doi:10.1007/s004390050816. PMID 9799080. ^ Nicotra A, Pierucci F, Parvez H, Senatori O (January 2004). "Monoamine oxidase expression during development and aging". Neurotoxicology. 25 (1–2): 155–65. doi:10.1016/S0161-813X(03)00095-0. PMID 14697890. ^ a b Razygraev AV, Taborskaya KI, Volovik KY, Bunina AA, Petrosyan MA (2016-07-14). "Monoamine oxidase activity in the rat pineal gland: Comparison with brain areas and alteration during aging". Advances in Gerontology. 6 (2): 111–116. doi:10.1134/S2079057016020120. ISSN 2079-0570.